Wow I am very impressed what a beautiful beautiful blanket!!! That is absolutely beautiful, a huge well done! Qnd you picked such great colours! My quilt is currently three years in the making and not nearly finished – one day! A very big well done – looks fabulous! Dit was al die ure se werk werd dis so vrek mooi. En hoe dit aanmekaar gesit is man alles is sommer net MOOOOI. It. is. beautiful. 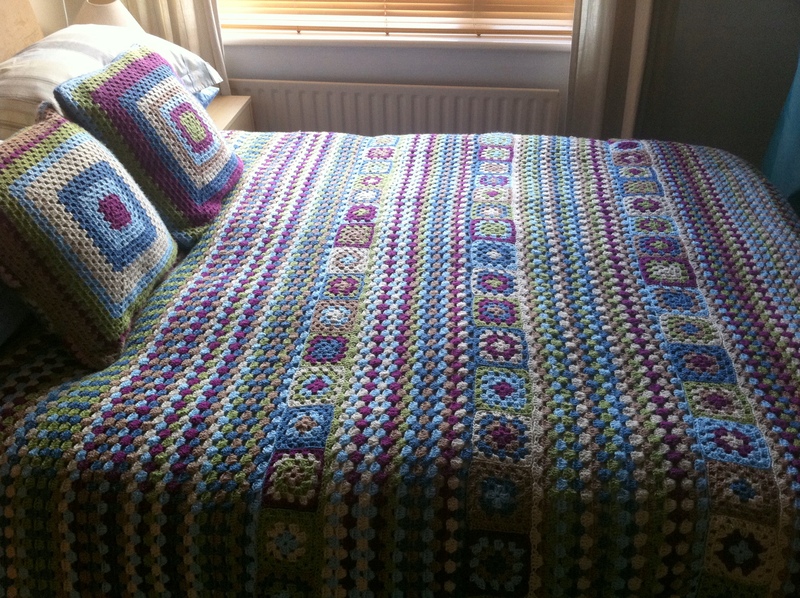 A bed with a crocheted blanky is just COMPLETE, don’t you think. Each night I tuck my little boy into bed and then put his granny squary blanky over him and it looks perfect. Yours give me strength for my ginormous ripple I started a few month ago…..
Wow, this looks great! It is hard to believe that the random stripe generator could produce something so awesome – but then again, randomness appears in nature, too. I’m in the midst of a bedspread myself, so I applaud your bravery! This is so beautiful and just love the info you wrote while in the process of this journey. It was so funny to read all about your feelings, being so tired of it but then comes the real thing and you put yourself into the blanket and complete it. Well done and thank you for sharing. Dit is baie mooi, jy kan werklik trots voel. Ek is nog ‘n beginner wat hekel betref en het groot bewondering vir die hoeveel tyd wat jy hieraan spandeer het. Wel gedaan. It is stunning! You did a really good job! Congrats! and the colors are beautiful! I absolutely love it, love the design, it is so original and nice to see something different in the world! Well done :O) I want to make one now too! Thank you all for all your lovely, uplifting, encouraging comments. I appreciate it so so so much! OMG! This is beautiful and I am so inspired. 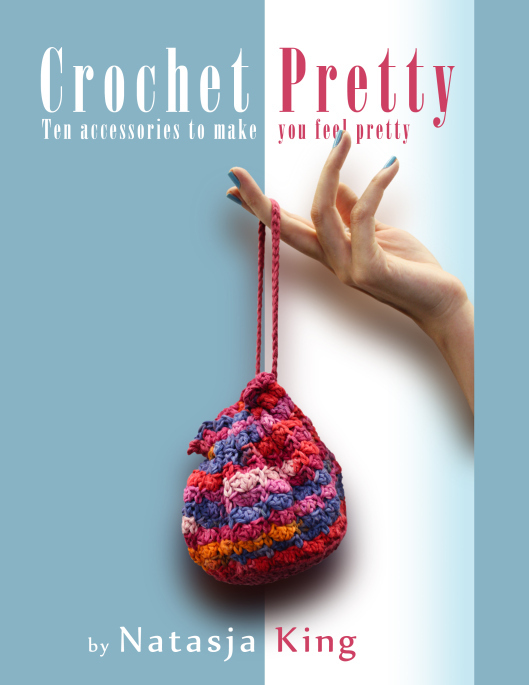 I will put this on my “must crochet in 2012” list. Love it! im with you.. I love it 🙂 and the colours. Is dit nie net so absoluut dit moeite werd nie! Well done oor en oor. Dit is werklik n pragtige deken, wel gedaan! Ek wil so graag ook so iets aanpak maar net al die bedrywighede om jou kom n mens nie daar by uit nie Dit is werklik n erfstuk. Ag dis te mooi! Kyk ek het heel toevallig op jou blog afgekom en hekel sederdien te lekker. Ek sal nog drie keer moet lewe om alles te hekel wat in my kop is- dankie. Jy laat mens se vingers lekker kry!! Magtig maar dit is mooi, jy het baie om op trots te wees. Dit lyk pragtig. What a fantastic blanket. Worth all the time and effort! I chuckled several times reading your progress ….sounds just like me! I too get excited at the start of one of these projects, midway thru HATE the darn thing but when finished somewhat remorseful that its over!!!! I just went and found the Biscuit and Jan stripe generator. Now that is a cool tool. I made one twin size blanket in one color…talk about getting bored! Thanks for the information and what a fantastic blanket you have made! Thank you everyone for all your kind comments, both here and on the Knit and Crochet Now! Facebook page. Your words mean so much! Well done Karina! I joined the blocks to the stripes by crocheting them together but it did take a lot of effort to get them to line up and space them evenly. I used safetypins to pin the squares to the stripes and then tried to space my crochet stitches evenly between the two safety pins so that it wouldn’t bunch up of stretch too much. Thanks Natasja! That helps. It looks nice…. But it is an effort! Dankie! Wow, it’s gorgeous! Congratulations on finishing this masterpiece. This blanket is just amazing. The bed looks beautiful and it must have been so much work. Just such a gorgeous piece of crochet, well done!!!! This is fab!!! Happy snuggling under your master piece! This is beautiful. It gives me hope. 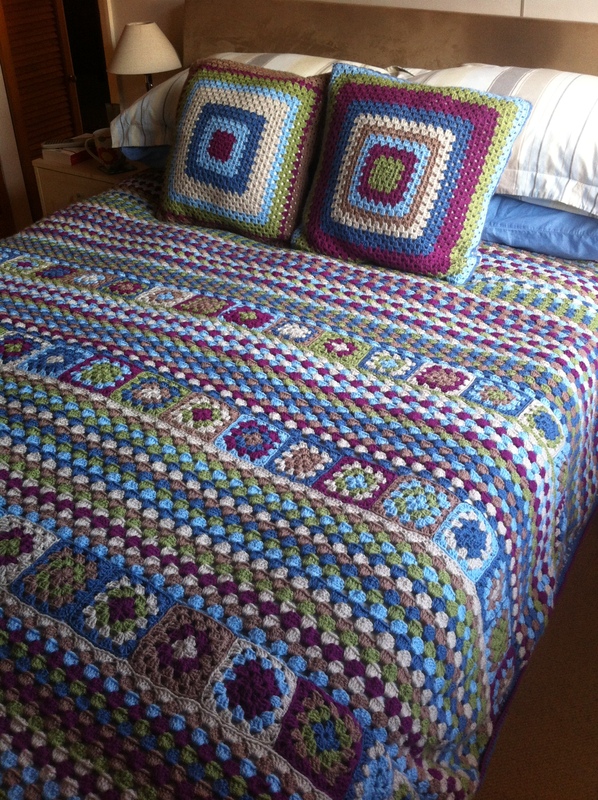 I started a single bed blanket last year and also switched to some granny squares in the summer, here in Durbs it is too hot to crochet big things in the summer. I am new to crochet and this is my first blanket ever so if it looks half as good as yours I will be thrilled. Keep up this blog I am so inspired. Me encanto, estoy facinada, tengo muchas ganas de hacer una, pero no tengo mucho tiempo, necesitaria saber cuantos kilos x color usaste y de que medidas es la manta, no tengo idea para calcular.Gracias por compartirlo, felicitaciones!!!!!!!!!! Wow congratulations on such a beautiful piece of work. Well done for persevering with it. 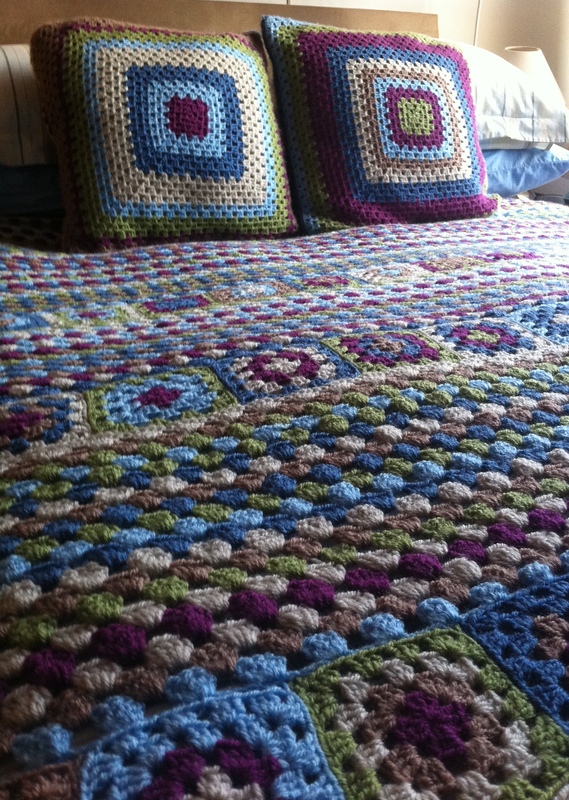 Your crocheted coverlet is really beautiful! You have inspired me to tackle a king-size one for my own bed [making googly eyes]. I’m going to check out that Random Stripe Generator, too. 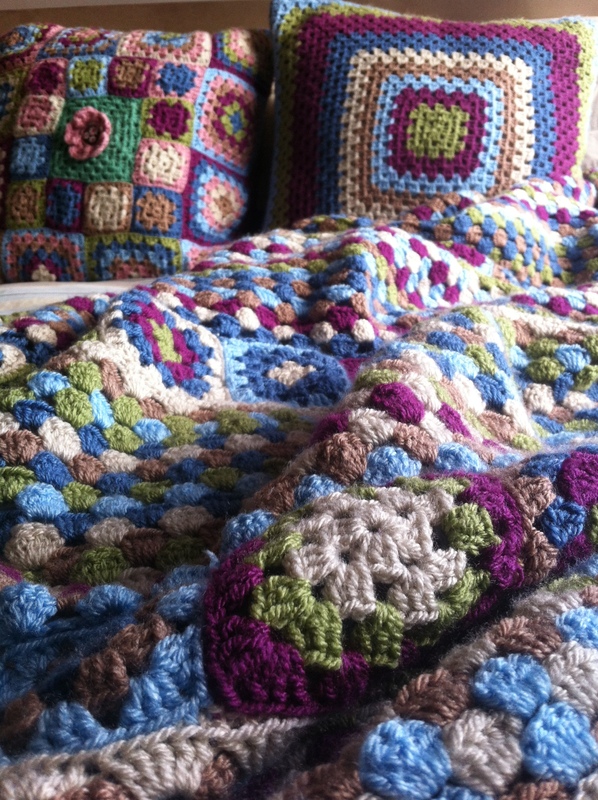 I would love to see granny square and striped coverlets or blankets others have been inspired to create per this post. 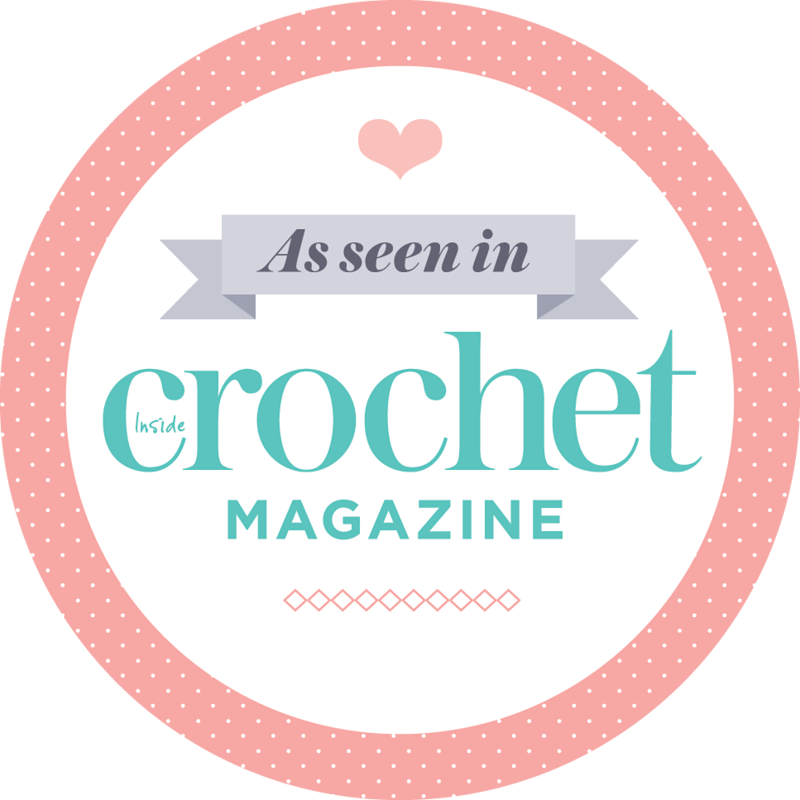 Please send out a call for all crocheters to fire up their cameras and upload pics of their work! Thanks Lynn! Crocheted blankets are the best, I’m sure’ you’re going to love the one Helen is making for you. I love this! Going to make one! I just love it!!! Can you tell me how you figured out how many chains to start with. I am pretty new I crocheting but I would love to try and make an afghan size!!! 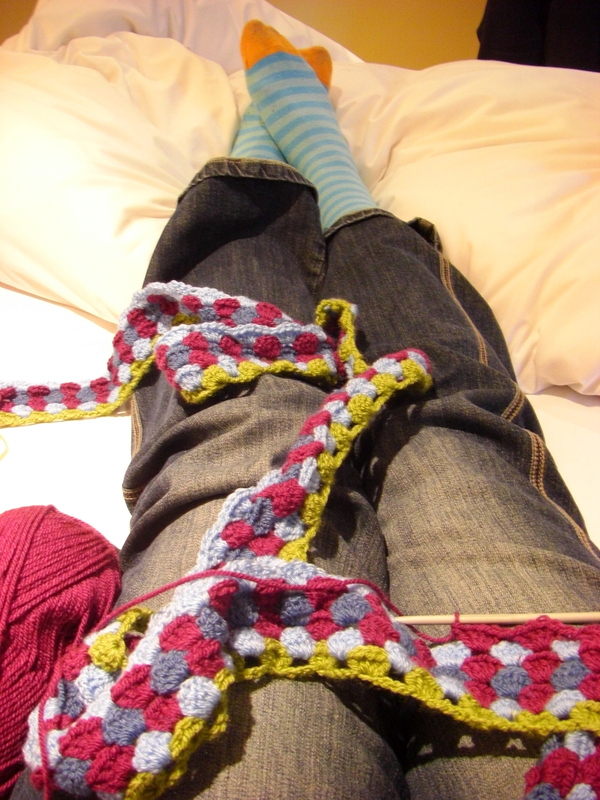 I didn’t know much about crocheting a blanket either so I just made a foundation chain and and kept going until it covered the width of the bed. My mistake was that I didn’t take into account the foundation chain would stretch and the weight of the crochet would also pull down the crochet, so it ended up being very big. length of a full size blanket in inches and multiply the number of chains times the length of blanket. That should get you the approx. foundation row for you blanket. (Ex: if there are 7 chains in one inch, and you measure the blanket as 72 inches, you multiply it and you’d get 504 chains for the foundation row). I suggest with a lot of chains, you have something to mark the number of chains as you are going along. I would suggest doing what this lady says. Thank you so much that the info!! I will be starting it today!!! Don’t you have to know how many stitches are in your granny squares, so they match up with the stitches in the strips? It may have taken a long time to make but is so pretty it was well worth it. Wow, I love your blanket, the colours are gorgeous, along with the cushions it really makes a statement. I know how you feel about it being a never ending project as I am just finishing off my fourth blanket. I decided to make one for each of our children and it has been quite a task. Beautiful! On my ‘to do’ list as of today! I clicked that link and still get the wrong pattern. I tried to send you a copy of the picture I get, but it won’t let me. Is it possible for you to copy the pattern and email it to me? My email address is stickaren@aol.com. I would really appreciate it since I have already ordered the yarn!! Thanks Natasia!!!!!!!!! Very nice…love all the colors! A true work of art. Am busy making 9 blankets, one for each grandchild (there is another on the way) and the eldest wanted every colour I could find soooo, I am making this one! What I would really appreciate knowing is if you worked your strpe sections and crocheted them onto the granny squares as you went. Or sewed them together afterwards ? Wow Val, that’s a mamoth task! Good luck with all the blanket making. I’m glad this one is one of the nine you have chosen. You certainly can utilise all the colours in your stash with this design 🙂 I crocheted the stripes and then made each granny square seperately. I then laid them out in a long row next to each other so that I can see how many granny squares I needed. 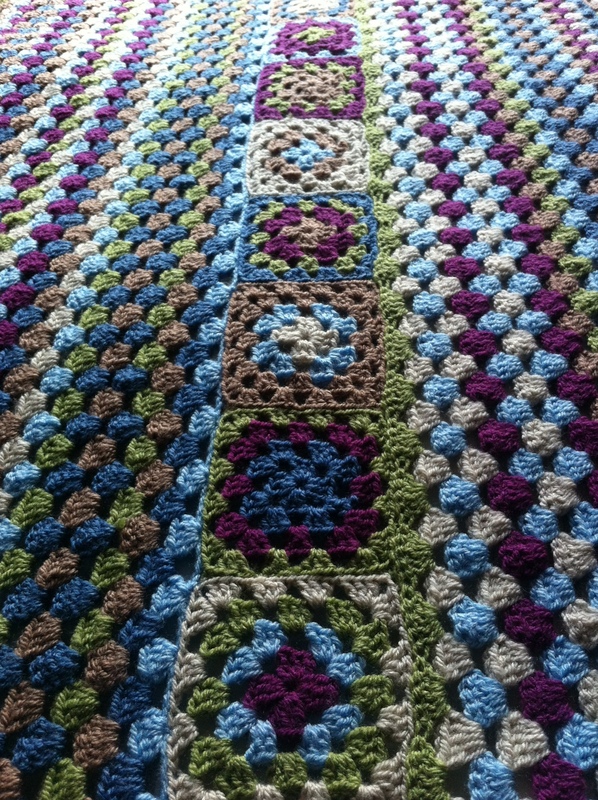 I sewed the short sides of the granny squares together to make a long strip of grannies. Then I pinned the row of grannies to the stripes and sewed them to the stripes (I had to pin them so that I would be sure I don’t stretch them out of proportion). When I started the stripes again, I created the shells in the stitches of the granny squares. I hope this is clear and helpful. If not, feel free to contact me again. Hello Natasja! Thank you for sharing this creation. I was wondering how you got it started. I’m attempting a blanket similar to yours, but I can’t seem to start it nicely. Can you give me any help? Very pretty, I love the colours! Hi there. I’m happy to hear your boyfriends chose my blanket design. 🙂 The pattern for the squares are just traditional granny squares. 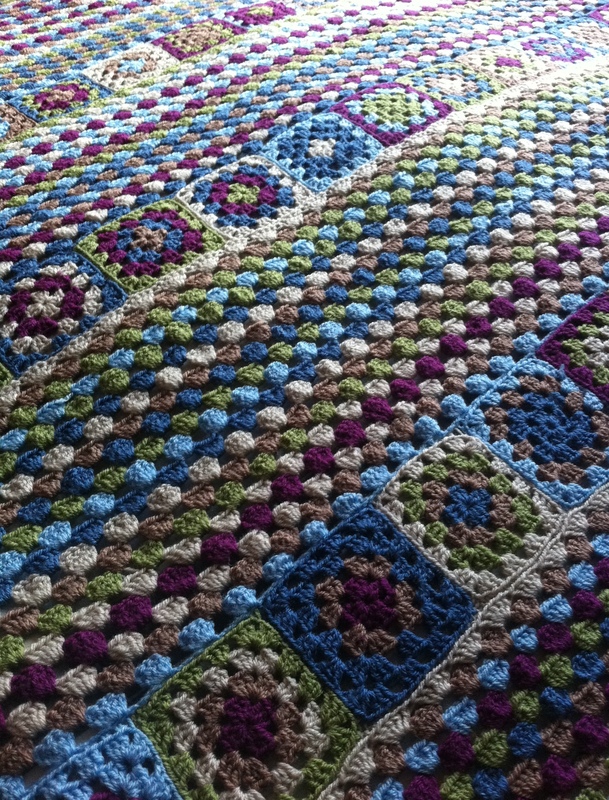 If you look on the Photo Tutorials tab of my blog, you will see step by step instructions for making a traditional granny square. I joined all the squares together to make a long strip and then sewed that strip of granny squares onto the row. Thank you so much 🙂 Have a wonderful day! That looks beautiful, the colours and mixture of pattern look great together. Well done!! I made a plain cherry red granny square double bed blanket for my son’s girlfriend, so I know the work it entails. I only offered to make her a cushion and she asked for a bedspread!! I love it… you are so talented.